Last month an anti-oppression training was offered to new Co-op staff and Board members. I learned that I needed to build on this training because, while a lot of us found it highly informative and very insightful, we found we needed more time to process the material. Also, it was intimidating to be put into a random group of people, working on addressing such a big topic in just five hours. I decided that it would be important to share my thoughts with the Co-op membership while it is still very fresh in my mind. To be clear, I am not an expert in anti-oppression work, and my intention is not to give you a training, but rather to share how I feel. 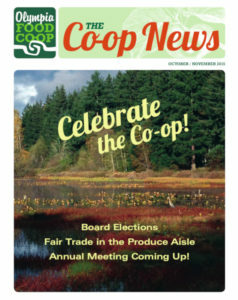 I would appreciate any comments or suggestions you may have that would contribute to our continuing this work on anti-oppression at the Co-op. After weeks of meditating on it, and years of being on the receiving end of oppression on a daily basis, I want you to know that I accept my part in oppressing other people because we all do it, whether consciously or not. As a friend of mine put it, “It can be tempting and easy to enjoy the benefits of unearned privilege, but that privilege can only be possible if someone else is underprivileged.” Oppression makes the oppressed feel confused, crazy, unsupported, depressed, frustrated, miserable, and without access to power that should be shared equally. Oppression, I find, is like the food chain. We all have a place in it. And we all also have the power to change it. I have experienced many kinds of oppression, which has led me to learn and create safe places to talk about it, but my frustration remains, and fear of violent oppression is always there for me. I have discovered that oppression is an intricate web of daily aggressions at all the levels of human interaction that can affect anyone. The most annoying form of oppression that I have experienced here in Olympia has been the daily microaggressions that come from well meaning friends, family, community, coworkers, acquaintances and at many places of business in Olympia. And the most typical: being followed around the stores if you fit some stereotype. Do not target people. Anybody could steal. We should not forget the “Black Lives Matter” movement that sprung out of people reacting to these micro and macro aggressions oppressing black people and so many other minorities every day. I know that people say “we have come a long way.” Yes, we have, but it isn’t over yet. The recent events in Ferguson, MO, and elsewhere have proven that the daily grind of oppression can become deadly. Maybe we’d rather not name acts of violent oppression like the shooting of the brothers Andre Thompson and Bryson Chaplin here in Olympia, because it makes us feel guilty. We can no longer ignore the institutionalized oppression in this country. I wonder how responsible we may all be for this happening in our community. We should examine our own daily oppressive behaviors that may be feeding these acts of violent oppression in our community. If it is not affecting you and me directly, please let’s think long and hard, how it does affect all of us regardless of our place of privilege in this town and in this world. We have the power to take action. Let’s take time to learn about oppression and anti-oppression work in our communities. Thanks for supporting me as a Board member for the past three years. If you have any comments, please send them to me before the end of my term in December. 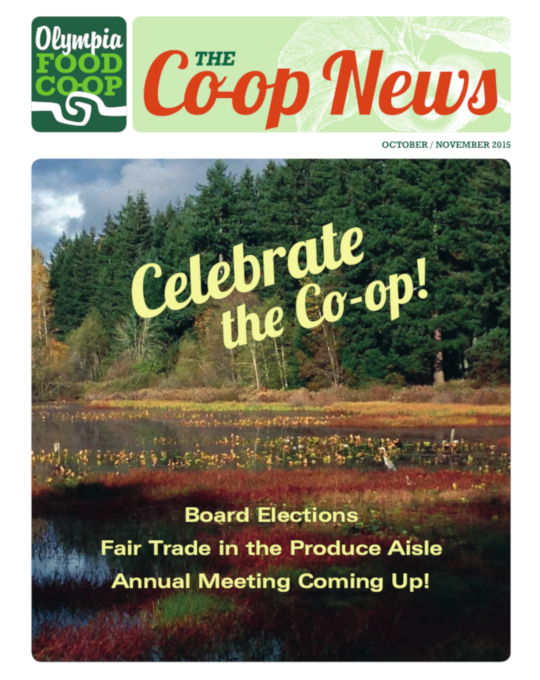 I will see you at the annual Co-op meeting on October 17th.